Members of our congregation demonstrated their support for Interval House and generosity in January 2018. A few years back our Advent schedule experienced compression with the Youth Group service and Sunday School Pageant Sundays. We realized there was no time for our service to receive gifts from members of the congregation and integrate this into an already busy series of services. We checked with Interval House and came to an agreement we would hold our service to receive donations of items after Christmas and later in January. It would help them with the increase of donations at Christmas and a drier spell following that time. In January 2018 Munster United Church and Ashton United Church scheduled the service for later in the month. 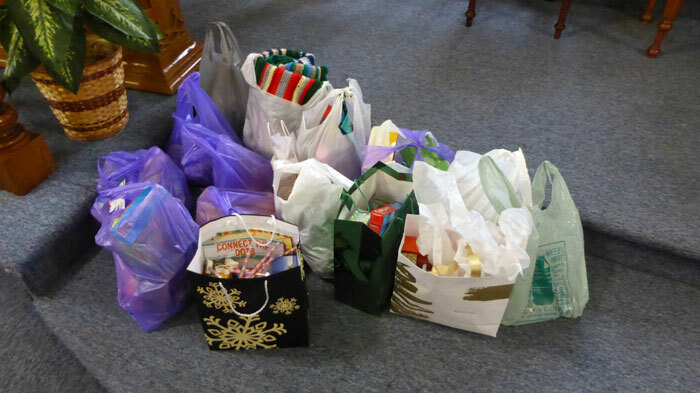 Our congregation responded very generously with many bags of items and goodies. In our last service in January, we received the gifts. Later the following week we arranged with Interval House to deliver the donations. The representative of Interval House was most pleased with our gifts for them and assured us they would all be put to good use. Below is a photo of the bags as they sat in the church. It doesn’t look like much but the bags are larger than they appear and they filled the back of an SUV.